India's Prime Minister Narenda Modi escorted by AfDB president Akinwumi Adesina arrive at the opening ceremonies of the 2017 Annual Meetings of the African Development Bank (AfDB), which opened in Ahmedabad, India, on Tuesday, May 23, 2017. 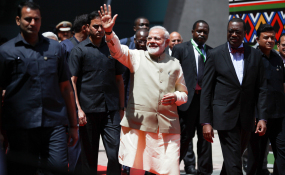 In his speech, prime minister Modi reiterated the centuries-old strong ties between India and Africa, noting that India’s partnership with Africa is based on a model of cooperation that is responsive to the needs of Africa. The 52nd Annual Meetings of the Board of Governors of the African Development Bank (AfDB) and the 43rd Meetings of the Board of Governors of the African Development Fund (ADF) opened in Ahmedabad, India, on Tuesday, May 23, 2017 with calls for greater cooperation calls for greater cooperating between the Bank and India to help drive Africa's transformation. For his part, AfDB President Akinwumi Adesina shared the Bank's new transformation agenda encapsulated in the High 5s and underscored the need to support the Bank with the resources required to enable it accomplish its ambition programs for the good of the African continent.